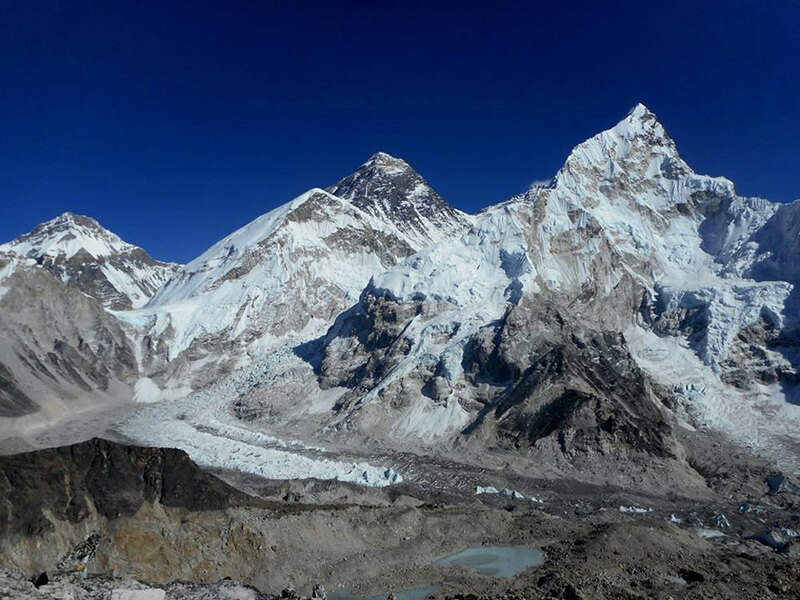 If you are adventure lover and searching for the world’s most beautiful demanding trek then Everest Base Camp with Cho La Pass is the best choice ever. It is perfect circuit in Everest region which offers every single day different landscape, villages, untouched Sherpa culture, flora and fauna etc. The Gokyo Trek via Everest Base Camp starts from Lukla 2840m after 35 minute of scenic mountain flight from Kathmandu. The first day of short hike begins from the first Everest climbers Edmund Hillary and Tenzing Norgay Sherpa airport towards to Phakding. Second day we will continue to Namche via Monjo. From Monjo onward we will start Sagarmatha National park which was established in 1976 then listed in UNESCO world heritage site in 1979. Trekkers should obtain National Park entrance permit from Monjo Sagarmatha National Park office which will cost 3390 Rupees for foreign national and SARC National will cost 1695 Rupees including 13% vat. Make sure every trekker have their original passport with them. Gradually we will head to Namche Bazaar (market) passing some suspension bridges, beautiful lush forest, Chautara (resting spot for local porters and trekkers) which offers first glimpse of Mt. Everest and reaches at Sherpa capital Namche Bazaar. If you are in weekend in Namche then an ancient local market might be worth visiting here. While Namche Bazaar is situated 3440m from sea level, most of the trekkers will have one extra day for acclimatization in their trekking itinerary. It is the beautiful village to spend couple of night in term of exploring beautiful Himalaya surroundings, fancy tea hoses, organized market and unforgettable side trip. 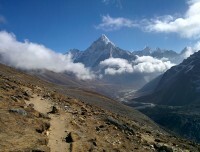 After spending couple of night in Namche, the pleasant trail leads to Tengboche passing by intersection of Gokyo valley. Tengboche is one of the best spot for trekkers to have amazing views of white Himalaya just standing in front of you as a mirror including Everest, Lhotse, Amadablam and so on. Also visiting Monastery at Tengboche adds extra cultural value on our trip. Gradually we will continue ascending and have another acclimatization day in Dingboche then reach at Gorakshep 5140m ultimately. It is our final tea house where we will stay overnight and explore roof of the world’s Everest Base Camp and amazing view point of the region Kalapatthar 5550m. It offers nothing than 360 degree aggressive Himalaya vistas just in front of us such as Mt. Pumari, Mt. Everest, Nuptse, Amadablam and countless snow caved giant peaks with golden color of sun rise/sun set. 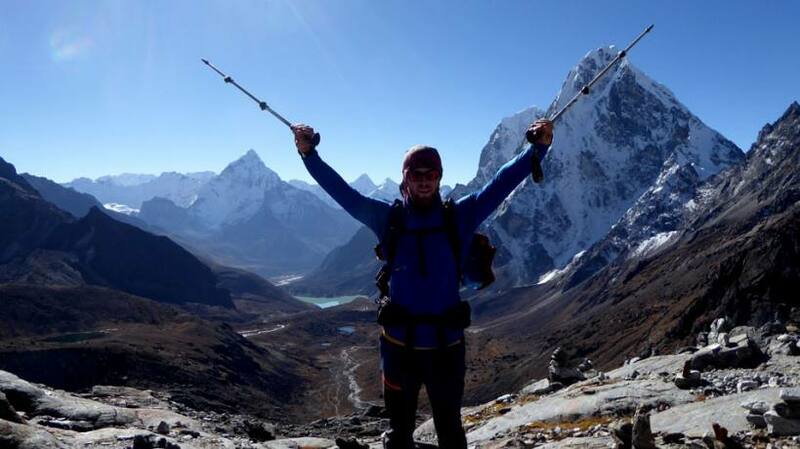 Now our trek will lead to the challenging pass Cho La (Chhugyuma La) 5420m and greets us by mesmerizing views of Himalaya from the top and descends to natural paradise Gokyo valley. Early morning trekkers will hike to Gokyo Ri 5360m which will let us final opportunity of exploring undisturbed Himalaya in 360 degree including massive shape of remarkable Mt. Everest, Lhotse, Makalu, Cho oyu and many more graceful white peaks with beautiful sunrise and sun set. Finally collecting full of lifetime memory, we will descend to Lukla via Mechharmo, Dole, Mong Danda and Namche. Lukla is the best place to celebrate your life time achievement in the Himalaya with your team just before arriving in Kathmandu. Next day early morning we will final good bye to Lukla and unforgettable Khumbu region. March, April, May and September, October, November are the best time of the year to explore Gokyo trek via Everest Base Camp. If you have further query and prefer to customize your own taste and duration of holiday then please feel free contact us. Unspoiled Sherpa hospitality, their culture, religion, dialect etc. Day 01: Greet at airport then transfer to the hotel. Day 10: Lobuche to Gorakshep (5140m, 3hrs), Then hike to Everest Base Camp 5364m after lunch at Gorakshep. Day 12: Dzongla to Dragnag (4700 7hrs) via crossing Cho La 5420m. 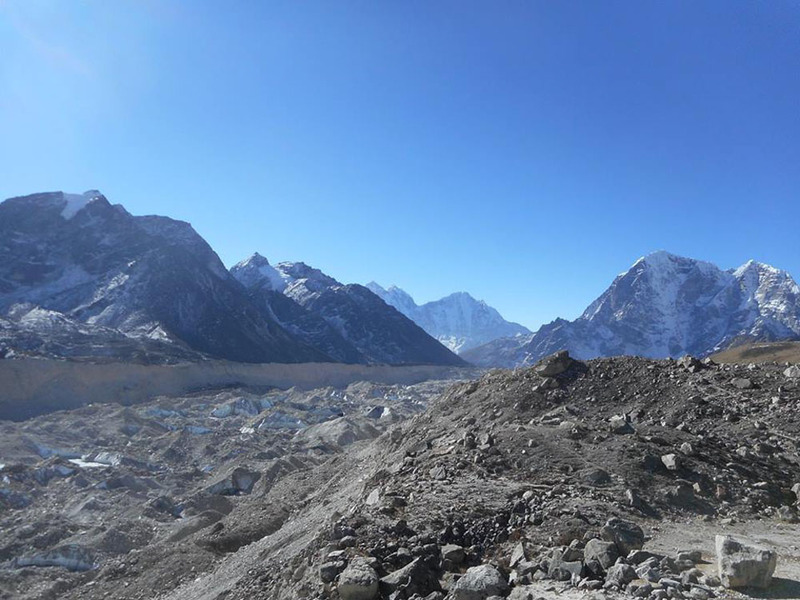 Day 14: Hike to Goyko Ri (5360m, 2hrs) to explore one of the best view point of Everest region then back to Gokyo. Day 18: Lukla to Kathmandu by flight. All necessary trekking permits like Sagarmatha National Park, TIMS Card etc. 3 Times meals a day such as Breakfast, Lunch and Dinner during mountain. Seasonal fresh fruits like Apple, Banana, Pomegranate etc. Personal expenses such as trekking gears, laundry, hot shower, lost & theft, personal insurance, wifi, battery charge etc. All drinks such as cola, mineral water, alcohol, chocolate bar, snacks etc. Note:- Above itinerary is just a guideline. If you are not satisfied please feel free customize your own. We are quite flexible to do the way you prefer. Day 01Greet at airport then transfer to the hotel. Welcome at airport then transfer to the hotel. Introduce about forth coming program then enjoy your first night in cultural diversity Kathmandu. Free day for final trekking preparation and feel free to spend the way you prefer. After taking 35 minute of the most beautiful scenic view of mountain flight we will reach at Lukla. Our most thrilling journey begins from here and lead to Phakding village passing by lush scenery, terrace and beautiful Mani walls etc. Reaching at 3440m Namche Bazaar crossing some long suspension bridges, entering Sagarmatha national park, dense of pine and rhododendron forest and the first beautiful view of Mt. Everest and Kusum Khangkaru will encourage us to end up the last challenging steep part of the trail. Since good acclimatization is essential to hit our final goal, this is one of the crucial days for trekkers to have extra day above first three thousand meter. Namche Bazaar is known as Sherpa capital and offer beautiful side trip such as Everest view hotel, Khumjung valley, ancient Thame Monastery etc. The Everest view hotel hike is quite fascinating to explore undisturbed towering Himalaya such as Mt. Everest, Lhotse, Amadablam, Thamserku and many more stunning snow caved peaks. The local weekend market, Sherpa Museum and beautifully organized shopping stores, bakery, cafe, restaurant etc. will add extra value on the trip. 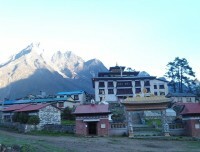 The pleasant walk from Namche to Tengboche will be memorable in term of glittering Himalaya surroundings. Tengboche is situated at the top of the ridge which offers 360 degree white mountains views just as a mirror. 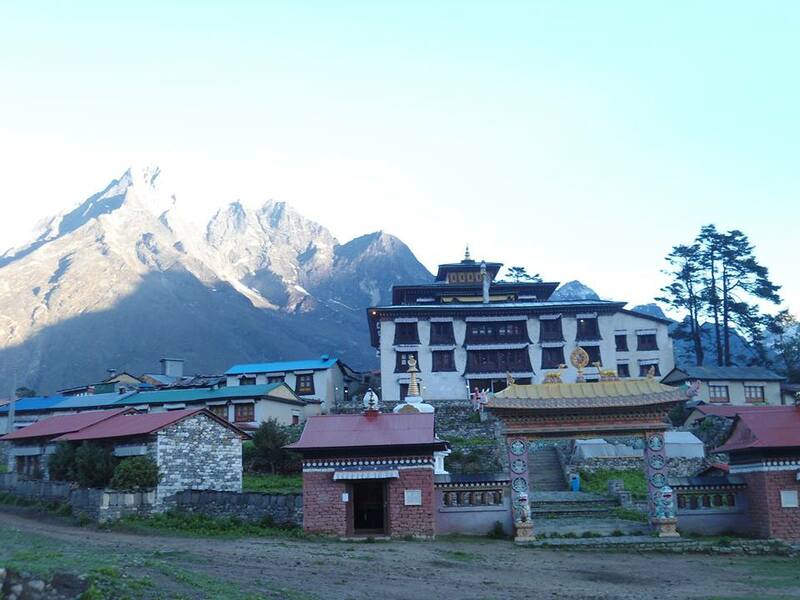 Observing Tengboche monastery and chanting at evening and morning will be really worth it. The trail will descend gradually via shaded forest, cross suspension bridge and head to Pangboche. After 45 minute walking from this village we reach at Sumare where we might have lunch before arriving at Dingboche. It is one of the massive Sherpa village and offer amazing views of Amadablam, Lhotse, popular climbing peak Island Peak, Tabuche Peak etc. Final preparation for our last destination. We can hike Chhukung Ri or just above the ridge which can be discuss with your guide. After breakfast the trail ascend all the way passing by some Yak pasture and reach first tea house at Thukla. Since we do not have any opportunity of tea houses in between Thukla to Lobuche, we might have some snack or lunch right here. Then after ascending steep part of 45 minute we reach at Thukla Pass where we can observe plenty of different nationalities monument who were died during summit of Everest and more. Ultimately we arrive at Lobuche. Day 10Lobuche to Gorakshep (5140m, 3hrs), Then hike to Everest Base Camp 5364m after lunch at Gorakshep. This is one of the enormous day of the trip. After hiking 3hrs from Lobuche passing by immense Khumbu glacier and moraine we reach at Gorakshep where we will have a final overnight. We take lunch then head to roof of the world Everest Base Camp. The rare experience of standing at base camp of the tallest mountain will be incomparable ever. Then we will back to Gorakshep. Early morning, couple of hour challenging hike from Gorakshep to Kalapatthar will the most memorable part of the trip and entire life. The spectacular 360 degree massive graceful Himalaya views takes you some where of the natural paradise and returned you the value of tough journey so far. After capturing all the beautiful glimpse in our eyes, we will back to Gorakshep and continue to Dzongla. Day 12Dzongla to Dragnag (4700 7hrs) via crossing Cho La 5420m. What a day today! We will encounter another challenge of crossing Cho La and descend in Dragnag. 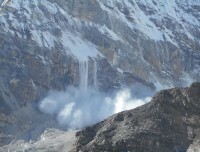 Chola will offer another breath taking views of Himalaya surroundings. Today is the shortest day of the trip will leads via amazing glacier and reach in Gokyo. This is one of my favorite place in the planet too. The beautiful Cristal clear lakes at the lap of Himalaya and Gokyo Ri will make our journey unforgettable ever. Day 14Hike to Goyko Ri (5360m, 2hrs) to explore one of the best view point of Everest region then back to Gokyo. Without hiking Gokyo Ri our trip will be incomplete. Standing at the top of Gokyo Ri and exploring the countless Himalayas let you full of joy and satisfaction. This is circuit of Everest region. The less crowded Gokyo trek will descend all the way to Dole. 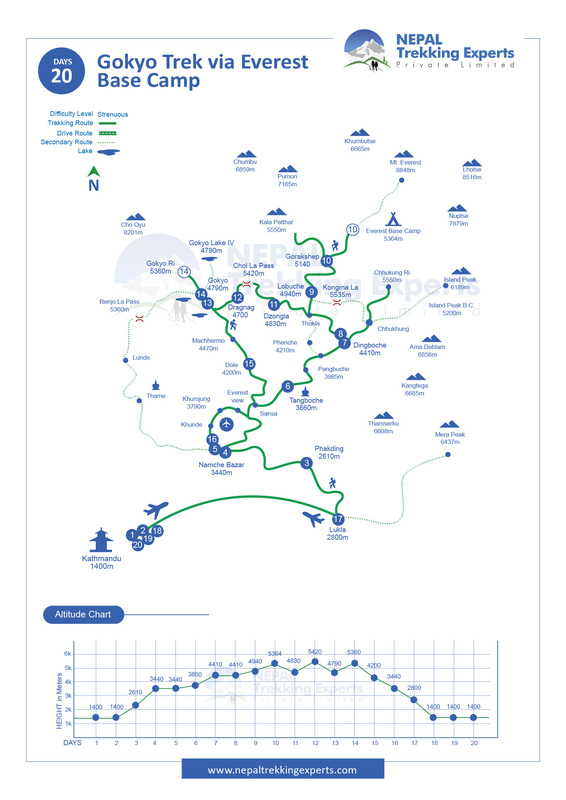 Since we have new route, it will never let feel less exciting. Today we will meet intersection of the trail from where we ascend all the way up. We will descend all the way to Lukla having some flash back. Day 18Lukla to Kathmandu by flight. After massive achievement of the journey, we will final good by to Khumbu and back to Kathmandu by flight.